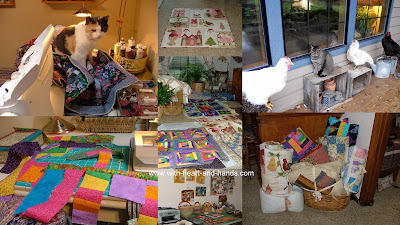 Michele Bilyeu Creates *With Heart and Hands*: Occupy Your Sewing Room! Unlike some of the "Occupy" movements involving sewing......and not with a political agenda, mine is definitely political! If I have to listen to these political ads for another year I will be certifiable. I've been told it is extremely hard to sew while wearing a 'banded and wrapped' white jacket. And even though I have sewn with one hand and a pencil in my mouth, I'm on a political mission to take over the house, man my station in my sewing room (and in my creative loft space....that I pretty much took over a long time ago) and sew, sew, sew! my way into and through out the next year! Join me and we can take over the world. We have outstanding work ethics, we are family oriented, we believe in good for all, and all for good, and we run our own domestic households, manage the household budget on 1% of a dime, and still have money for fabric.....and time for quilting. Yep, I am definitely an "occupier".......and I have an agenda! My occupy has officially begun. Who needs a tent when you can use quilts? PS: I think there is a cat underneath there somewhere...watch where you walk! Works in progress...everywhere they can be! Woo Hoo!! Michele for president 2012. I am trying to start today as well, after the math lesson, the dog who needs meds and hmmmm (maybe a call to the Chinese restaurant). Yours looks well and truly occupied! I'll stand with you on (in?) this occupation. Think I will let other family members answer the phone, I've ordered on-line pizza delivery, grandkids have been picked up- I am SO (or SEW) ready to "occupy" my sewing room and keep on sewing until I need to sleep! I have my budget balanced, I have plenty of stash, lots of food in the freezers and pantry, so I could stay in here for a while!!! Oh Michele, this is like getting a Christmas Card in the mail from YOU! I'm so smiling at all the joy in this post. What a great vibe. Thank you for Occupying a space in my life. :) *karendianne. Definitely "That Mad Crazy Woman in Oregon" for President! I have a disappearing black cat who reappears in the strangest places. When can we combine sewing rooms? I occupy my sewing room almost all the time - my computer is in here too! You need to move to Australia. We have federal elections every three years but wait... they are only allowed to campaign for the six weeks before the elections! We don't have primaries, etc; just one election on one day and it's done and dusted! Of course, we have political ads on TV but I've solved that too - I don't watch free-to-air directly: I record and filter out the ads as I watch the program! And I rarely watch "the news"! Peace for the brain! Too cute Michele- Love the collage - hope the cat and the chickens knew they are contributing to an important event. If you hurry, you can link up to the Occupy event I've had going on my blog and be eligible for my giveaway. Just a perfect reminder of how to find another focus. And I think you are right we will need a distraction from politics! I'm with you, Michele! I like the way you think. We will all have a good time at our sewing machines, and we can think of all the other women world wide who are sewing with us. I'll have to go check out that link. I occupy my sewing room every day of the week, nearly all day long - not that I'm sewing all that time of course! Seriously, if we could get quilters to quit sewing for a while and put them in government roles I bet we could fix a lot that ails this country!